All Art be Crafty, All Crafts be Art! Since moving to Florida I've discovered Palm Tree Art. It's the husks that palm trees shed throughout the year that people collect and use to create great works of art. So I just had to try! I've been scanning the ground around here for pieces of palm trees. This husk I found out by a pond near where I live. It was a pretty solid piece. The edges were a bit fragile so I had to trim a few pieces off but wanted to leave it as natural as possible. After coating it with a mix of grey, white, and dark blue I let that dry. Then I started putting in the details. The eyes were the hardest part to get even. 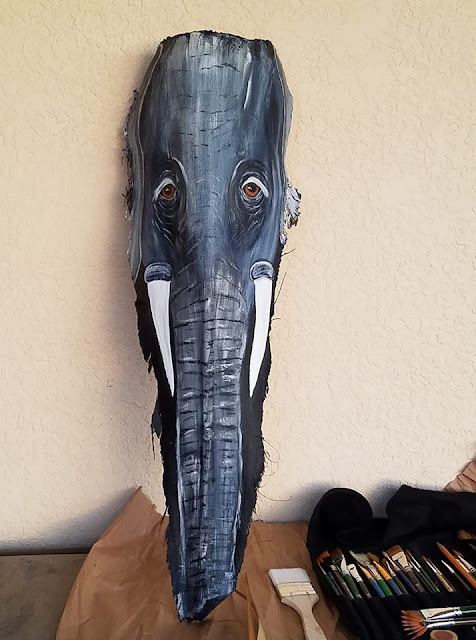 The husk has a big ridge down the center (which is why it fit the elephant face so well) and trying to get them even was a challenge. The same challenge was there in trying to make those lines across the trunk to give that wrinkly elephant skin look. After trying a liner brush with limited results I got out a small fan brush and went back and forth putting in this guy's wrinkles. To finish, I sprayed it down with a satin finish acrylic sealer. To hang I'm going to glue some self leveling hangers and then run a wire through them. I don't want to put holes into the husk because it will show on the front. So here's the elephant! What do you think? 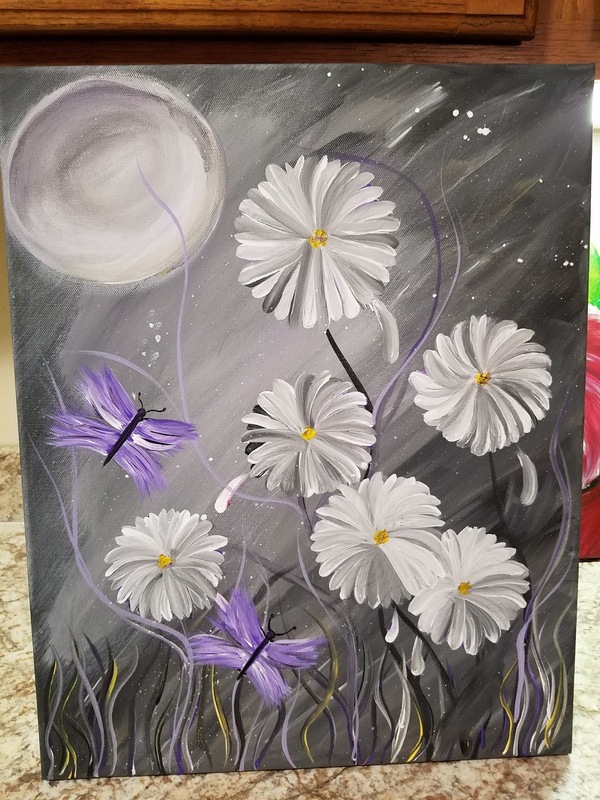 I went to an in-house paint and sip last night. The teacher brought us roses! Yay! I can't paint roses. They come out a garbled mess of lines that go no where, but I soldiered through. Now this paint night had no rules. We got the basic architecture of the rose and how to paint and blend. We had our roses and photos (with quotes! I love quotes!) Then off we went to interpret the rose however we wanted. 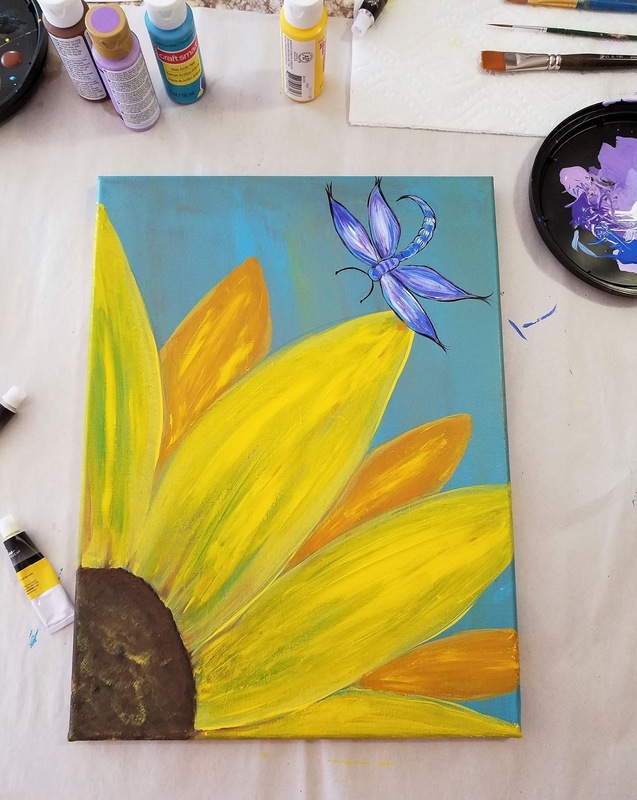 There were new and experienced painters and lots of laughs. 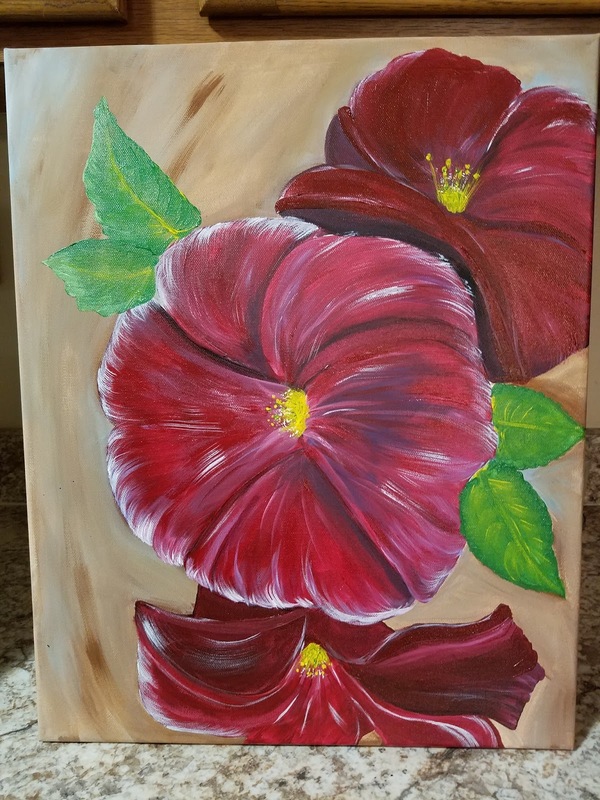 We came to the conclusion that roses are a hard flower to paint! Yet, the spirit of Valentine's Day called and we painted. I can't show you mine...it was bad! I stared at it all day today thinking...how do I fix this? 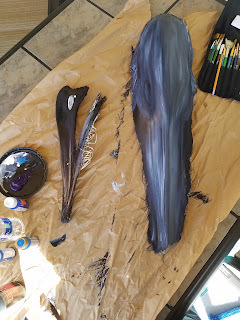 It's just a cold, blustery day in the north east and there's no way I wanted to brave the frigid temps, so it was either work on my next book or pull out the paint. This canvas had another painting on it that just wasn't working out. So I mixed some green, blue and yellow and blocked out the old stuff. Then did the center of the flower in shades of brown, yellow and black. The petals were done in two shades of yellow and green. A little of the brown mixture was streaked up through the petals for texture. The dragonfly (first time I ever painted one!) was done in light and medium purple, blue, black, and white. Sometime ya just gotta have some fun. A while a go I did this table with stain. It was a technique I saw in several sites on the internet and it was surprisingly easy to do. 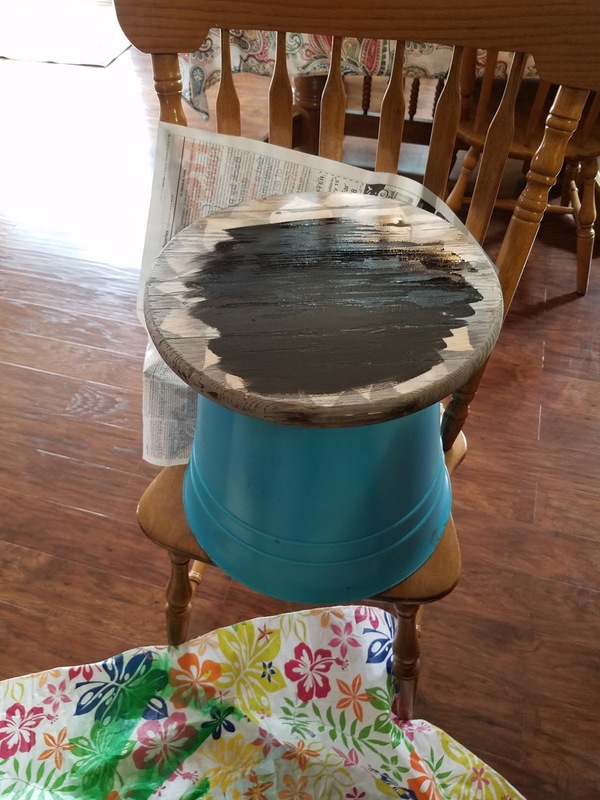 So, I've been wanting to update it and didn't think the stain would work again so I dragged out my acrylic paint and a can of clear sealer and went to work. First I sanded the top to have a smooth canvas. 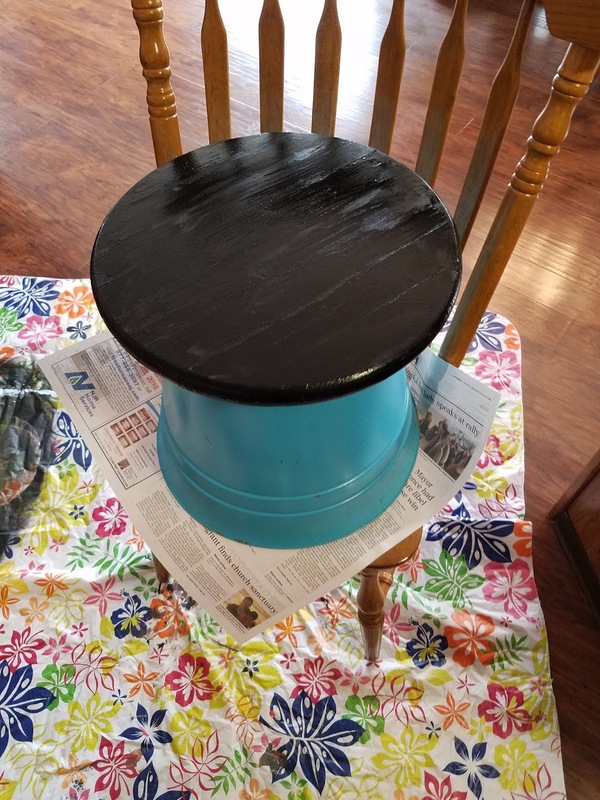 Then painted the top black so I'd have a good base and maybe the paint would help seal the wood a bit so I could work on it. 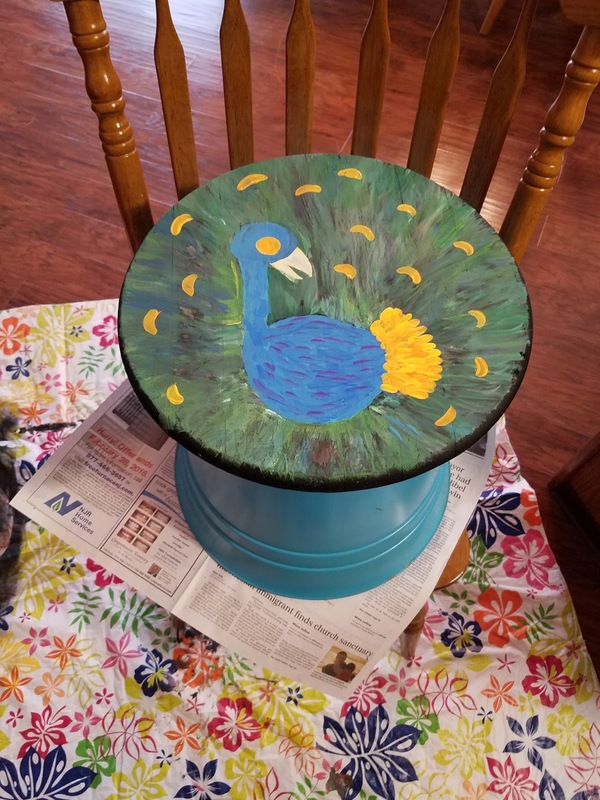 Next I filled in the peacock body in with a couple of shades of blue to give it some texture. The green feather-like area was put in with strokes of green, yellow, and purple. After the wavy lines were in place and still wet, I dipped a paper towel in water and dragged it from center to the outer edges to get a blurry streaked effect. 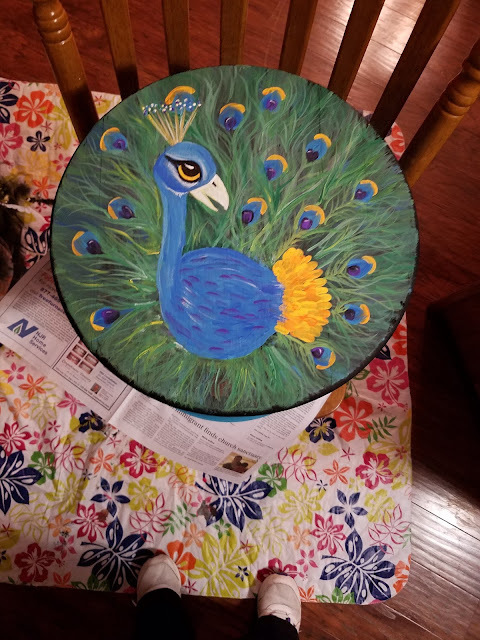 Next the eyes of the peacock feathers were painted with a blend of orange/yellow, a heart shaped blue, and purple dot. After that dried, long wavy lines were shadowed in to create that feathery look. On the blue body, the eye was painted in yellow for the iris and outlined with white. The beak is an off white. The hair like spikes on top of the head were outlined in black and highlighted with a blend of yellow/orange (heavy on the yellow) Dots were placed on top of the spikes in white, purple and yellow. Three coats of sealer were sprayed over the top and sides to (hopefully) give it some protection from the elements. Here in the North East we're in below 0 temps and hiding in the house. Fire in the wood stove, wine is poured and it's a great time to CREATE! We're looking to sell our house and move so my art studio is packed up in boxes. Wahhhaaaa! As the temps drop, I'll be filling some canvas with day dreams. How's by you? Keeping safe and warm? What's your cold weather craft? Trunk or Treat? Let's Buzz! Next up for the Trunk or Treat project: GIANT BEES! First lay out a sheet of paper and then scrunch more newspaper over it. When you have enough for a body wrap the bottom newspaper around the scrunched up stuff and use masking tape to secure. Squish and shape into the body of a bee. (From the first bee I discovered it's better to wrap the outside of the newspaper body in something with a solid color or the print shows through) Put a layer of paper towel over it to hide the print. Fold the table cloth in half and roll your newspaper bee body up in it. Secure with clear packing tape. For the tail, use the extra table cloth at the end of the body and twist it tight, trim to a point, then wrap in packing tape. cut 2 small strips of duct tape to make the stripe. To make the black strips on the bee body I used black duct tape. Construct your head the same way but cut a square of the black table cloth to fit over your bee head. Before taping figure out where the antenna will stick out. Cut small slits. Wrap the head and secure it with tape at the back. Flip over and insert antenna's. A dab of hot glue will hold them in place. I used Turbo Tacky Glue to glue the eyes in place. A quick slash of yellow paint for a cute little mouth. The honeycomb is just poster board and little bees as explained in the previous post. Of course I had to add some cute saying found on that Internet. SAVE THE HONEY BEES! BE HAPPY! BEE KIND! You got a bee-utiful Bee-mobile! Buzzing About Trunk or Treat! So, when my job invited each department to participate in a community Trunk or Treat I figured I'd go with the theme of my car. So, here's the start of what's going to be my Trunk or Treat car. First some pom poms and Turbo Tacky Glue (Love this stuff!) I glued them together and set them aside to let them dry. After they dried, I took two pipe cleaners and twisted them together to make legs. Then came the hot glue gun. My gun is really old and I burnt the heck out of my hand. I think it's time to get a new glue gun! I glued on the legs and eyes. Using an exacto knife I made holes in the head part and threaded a half a pipe cleaner through to make antennas. Michaels had CRATES on Sale! 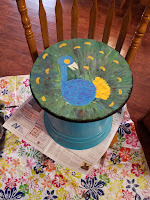 Arts Be Crafty on Pinterest! Visit Jeannie's profile on Pinterest. Want Arts Be Crafty Updates? Sign up here! Who is Arts Be Crafty? Mom, Writer, & Artist with two daughters who loves a crafty home. Happiest with a can of spray paint in hand and a plan to upcycle a piece of furniture. When I was a child and they asked what I wanted to be, I said, "An artist." They told me that wasn't a career and to pick something else. I did. Several something elses. None of them were me. With no art in my life, I was lost. After years of wandering, I've come back to art. And life is beautiful.